FACT CHECK: Fox News Banned in Canada? Fox News Banned in Canada? Claims that the Fox News Channel has been banned in Canada because they report false information are inaccurate. America’s middle class battles for its survival on the Wisconsin barricades — against various Koch Oil surrogates and the corporate toadies at Fox News — fans of enlightenment, democracy and justice can take comfort from a significant victory north of the Wisconsin border. Fox News will not be moving into Canada after all! The reason: Canadian regulators announced last week they would reject efforts by Canada’s right-wing Prime Minister, Stephen Harper, to repeal a law that forbids lying on broadcast news. Canada’s Radio Act requires that “a licenser may not broadcast … any false or misleading news.” The provision has kept Fox News and right-wing talk radio out of Canada and helped make Canada a model for liberal democracy and freedom. As a result of that law, Canadians enjoy high quality news coverage, including the kind of foreign affairs and investigative journalism that flourished in this country before Ronald Reagan abolished the “Fairness Doctrine” in 1987. 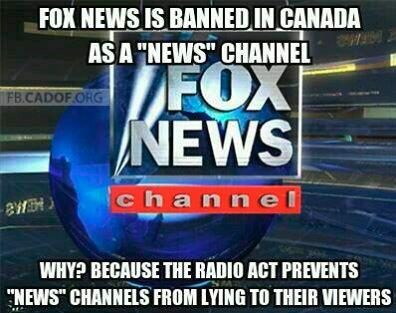 However, it is not true that such regulations have kept the Fox News Channel from gaining entry into Canada, or that they were invoked to boot Fox News out of that country after the channel was established there. 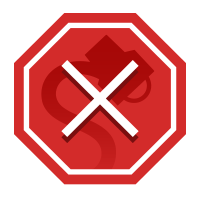 The CRTC regulations apply only to Canadian broadcasters using Canadian airwaves; they do not apply to the Fox News Channel, which is a non-Canadian entity transmitted via satellite and cable, not broadcast over public airwaves. The Fox television network (known as the Fox Broadcasting Company), which is a broadcast entity distinctly different from the Fox News Channel, does not have any affiliates or owned-and-operated stations in Canada, but Fox network programming is carried on cable and satellite providers in Canada and is available over the airwaves through several U.S. stations located near the U.S.-Canada border. The Globe and Mail. 7 February 2011.